This my favourite Freewheelin cover of all time. It's really about clouds. William Blake's ‘Ancient of Days’ provides the background to the upper part of the cover. From between the hungry clouds that swag on the deep, Blake’s God or Devil, however you want to read him, reaches down from a sunburst but not holding a set of dividers as in the original study but rather touching the shoulder of a Gemini, someone who suffers his own God and Devil simultaneously. Touching Blake’s clouds are Van Gogh’s stormy clouds as his black crows swoop over the cornfield where Vincent pulled the trigger to end the fight between his own genius and insanity. 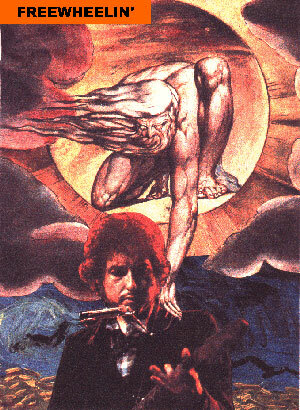 In the forefront Dylan looks down at his hands as they form a musical chord that will give rise to a song. His hair is aglow from Blake’s sunburst and his head, the centre of his creativity, is firmly set in the clouds from whence, on this particular occasion, comes his inspiration.